You and your partner are a team, and you want to raise your kids to be part of that team. (Not to mention there’s too much to do and not enough time for the two of you to do everything.) 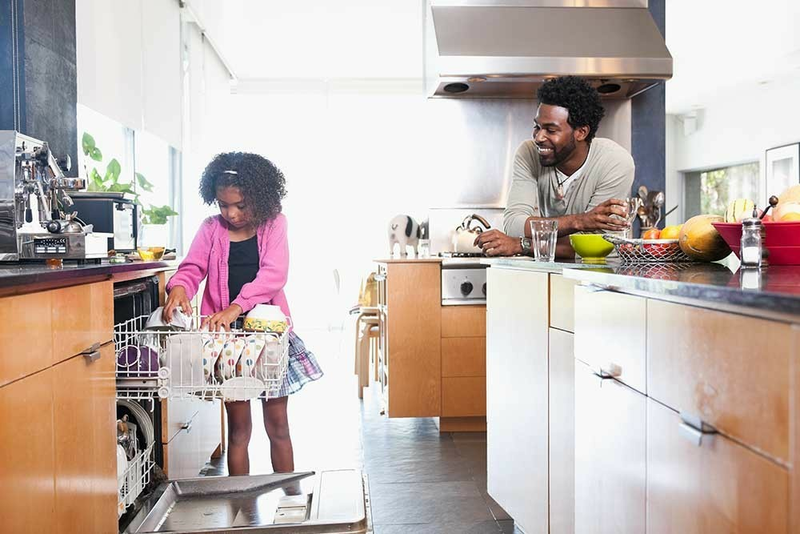 If you’re looking to get your kids to start helping around the house, these suggestions break down chores that your kids can help out with—even when they're as young as 2. In addition to helping you out, chores are good for your kids, helping to boost their self-esteem and organizational skills. Remember, kids mature and grow at different speeds, and can handle different amounts of responsibility at different times. If you feel that your child can handle a certain chore at a younger age, or if you'd rather postpone a chore until they’re older and more emotionally or physically prepared, by all means, trust your instincts; after all, you know your child best. Age 2 & 3: Young kids can follow simple instructions. The key: Don't ask if they'd like to do X, Y, or Z. Present it as "It's time to..." so you don't give your child an out, and praise them for helping. Create a rule that your child must help you put away their toys when they’re finished playing with them. They could also help wipe down the coffee table with a wet cloth or put trash in the garbage can. Ages 4 & 5:The goal here isn't perfection—your little one probably won't do the chores correctly every time, and that's okay. The idea is to get your kid in the habit. Teach your child how to make their bed each morning (even if it just means flattening out the comforter). They can bring plate over to the sink after dinner, or run a dusting cloth over their dresser. Help water the plants inside and out (in the warm weather, let them jump around in the sprinkler while they set it out to water the lawn). Ages 6 & 7: Adding more responsibilities to your kid's list may make them feel more independent. Let them sort the laundry, fill the dog's food and water bowl, set the dinner table each night, and help with raking the leaves in the fall. And if they want to jump in the pile of leaves before they bag them, who cares? Nobody said chores have to be boring. Ages 8 & 9: Give your child a few chore options and let them pick some from a list. If you have multiple kids, put everyone’s choice for the month on a whiteboard so they can check off when they do them. Putting away groceries, or laundry. Take the dog for a walk down the block. Help clean out the refrigerator. Your child can also help out while you cook dinner so they get comfortable in the kitchen, and you can let them assemble their own sandwiches and snacks for school lunches. Ages 13+: Your teen's schedule will likely become more hectic as they get older—especially if they take part in extracurricular activities or get a part-time job—so check in with them regularly to make sure they don't feel overwhelmed. Maybe that means giving them fewer chores or assigning chores to do on weekends when they have more time and energy. Give pets (or younger siblings) a bath. Get more great health and wellness stories at Parents.com/Strive.